: Following the opening of vast areas of land in the Australian States of New South Wales and Victoria, the sheep numbers increased so dramatically that some properties were over two million acres and ran over a quarter of a million sheep. In areas as extensive as these, herding (originally carried out by convicts) was impractical, wire fences were erected and sheep were left to run free. It was then necessary to have dogs to handle sheep in such large areas. A dog had to be developed to work in the conditions present in Australia. These conditions included heat, rough terrain, dust storms and vast distances. The Kelpie being able to perform the work of several men. Tireless workers in the hottest and dustiest of climates. : The general appearance shall be that of a lithe, active dog of great quality, showing hard muscular condition combined with great suppleness of limb and conveying the capability of untiring work. : The length of the dog from the forechest, in a straight line to the buttocks, is greater than the height at the withers, as 10 is to 9.
: The Kelpie is extremely alert, eager and highly intelligent, with a mild, tractable disposition and an almost inexhaustible energy, with marked loyalty and devotion to duty. It has a natural instinct and aptitude in working of sheep, both in open country and in the yard. 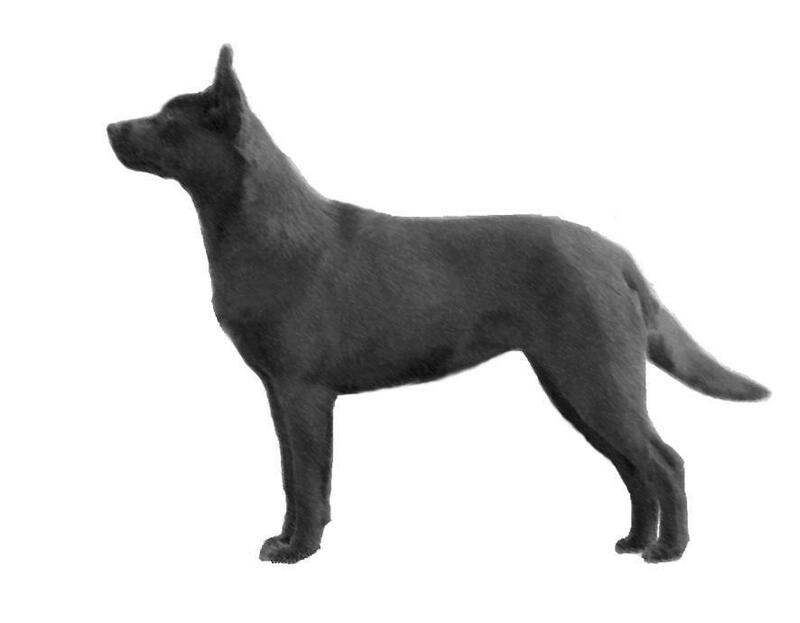 Any defect of structure or temperament foreign to a working dog must be regarded as uncharacteristic. : The head is in proportion to the size of the dog. The overall shape and contours produce a rather fox like expression, which is softened by the almond-shaped eyes. : Slightly rounded and broad between the ears. The forehead running in a straight profile towards the stop. : The colour conforms to that of the body coat. : Cleanly chiselled and defined, preferably slightly shorter in length than the skull. : Tight and clean, free from looseness. : The teeth should be sound, strong and evenly spaced, the lower incisors just behind but touching the upper; that is a scissor bite. : Neither coarse nor prominent, but round to the foreface. : The eyes are almond shaped, of medium size, clearly defined at the corners, and show an intelligent and eager expression. The colour of the eyes to be brown, harmonising with the colour of the coat. : The ears are pricked and running to a fine point at the tips, the leather fine but strong at the base, set wide apart on the skull and inclining outwards, slightly curved on the outer edge and of moderate size. The inside of the ears are well furnished with hair. : The neck is of moderate length, strong, slightly arched, gradually moulding into the shoulders, free from throatiness and showing a fair amount of ruff. : Strong and well muscled. Flanks of good depth. : Rather long and sloping. : Deep, muscular and moderately broad. Ribs well sprung and carried well back, not barrel ribbed. : The tail during rest should hang in a very slight curve. : The forelegs should be muscular with strong but refined bone, straight and parallel when viewed from the front. : Clean, muscular, well sloping with the shoulder-blades close set at the withers. : Should be at a right angle with the shoulder-blade. : Neither in nor out. : When viewed from the side, the pasterns should show a slight slope to ensure flexibility of movement and the ability to turn quickly. : The feet should be round, strong, deep in pads, with close knit well arched toes and strong, short nails. : The feet should be round, strong, deep in pads, with close knit well arched toes and strong short nails. : Should show breadth and strength. When viewed from behind, the hind legs, from the hocks to the feet, are straight and placed parallel, neither close nor too wide apart. : Fairly well let down. : To produce the almost limitless stamina demanded of a working sheepdog in wide open spaces, the kelpie must be perfectly sound, both in construction and movement. Movement should be free and tireless and the dog must have the ability to turn suddenly at speed. When trotting the feet tend to come closer together at ground level as speed increases, but when the dog comes to rest it stands four square. The coat is a double coat with a short dense undercoat. The outer coat is close, each hair straight, hard and lying flat, so that it is rain-resisting. Under the body, to behind the legs, the coat is longer and forms near the thigh a mild form of breeching. : Black, black and tan, red, red and tan, fawn, chocolate, and smoke blue. Males 46 to 51 cms. Females 43 to 48 cms. Any tendency of cow- or bow hocked. Movement that is restricted or shows stiltedness.